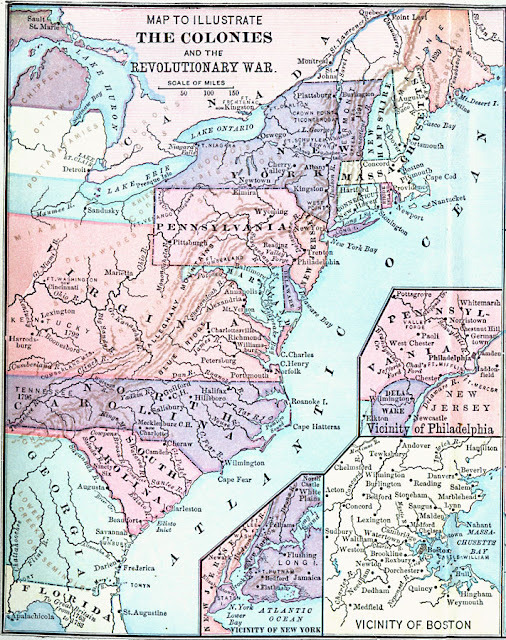 - The Southern Theater of the American Revolutionary War, encompassed the states of Virginia, North and South Carolina, Georgia and East Florida which was occupied by the British. Prior to 1778, southern colonies were mainly Patriot- controlled governing bodies and militias. In late 1778, the British began their operations in the south by capturing Savannah, Georgia. In 1780, they achieved victory over two Continental Armies in both Charleston and one of the worst defeats in U.S. military history, General Horatio Gates, loss at the Battle of Camden, South Carolina. However, the British were weakened by a large amount of casualties, unlike the Continental Army who's commander replacing General Gates, General Nathanael Greene, used the military strategy of avoidance as well as wearing the British down through casualties. This strategy was used in the Battle of Cowpens, Battle of Guilford Courthouse and Battle of Kings Mountain.However, it was the victory at the Siege of Yorktown that resulted in the British Army's surrender and ultimately the end of British rule in the Colonies. In the state of Virginia, there was the Gunpowder Incident of April 20, 1775. Lord Dunmore who was the Royal Governor of Virginia, in an effort to keep the Patriot Virginia militia from having necessary supplies, took stored gunpowder from Williamsburg and had it relocated to a British warship on the James River. However, Patriot leaders, such as Patrick Henry, caught on to this and would move supplies as Lord Dunmore continued his scouting for supplies. Toward the end of 1775, Dunmore promised freedom to runaway slaves who would fight for the British and formed what he called his Ethiopian Regiment. However, the Ethiopian Regiment, along with Dunmore's other troops were defeated at the Battle of Great Bridge , in December of 1775, by the Patriot militia. Dunmore was forced back to his Naval ships and never went back to Virginia. The British needed to have possession of the port that enabled the shipment of supplies and men, in order to have control in the south. They began by sending an expedition for the purpose of recruiting Loyalists in North Carolina. 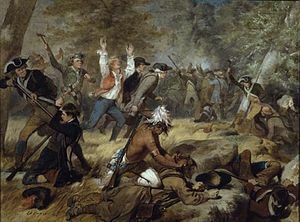 However, late February 1776, the Loyalists that were meeting the expedition from Britain, were defeated in the Battle of Moore's Creek Bridge. The British then attempted to capture Fort Sullivan, which guarded the Charleston Harbor. Led by British General Henry Clinton and Admiral Sir Peter Parker, the naval maneuver failed due to poor strategy. The failure to capture Charleston in 1776, gave room for the port to be used by the American forces until 1780. Georgia Patriots tried defeating the British that were based in a garrison at Saint Augustine, East Florida. It was a haven for Loyalists who ran from southern states. Charles Lee was the first to make this attempt with the Continental Army, but he was recalled to the main army. Then Georgia Governor Button Gwinnett and Lee's replacement, Robert Howe, made a second attempt in 1777, which also failed. In the end, tropical diseases and command differences, resulted in the British holding Saint Augustine for the remainder of the war. With the Continental Army suffering defeat at the Battle of Camden in August of 1780, British Army Officer, Lord Cornwallis, saw the opportunity to acquire Loyalists to add to his force. However, the Battle of Kings Mountain which occurred on the border with South Carolina, in October of 1780, resulted in the Patriot militia defeating a large number of Loyalists. That significant defeat along with interruption of supplies and communications, forced Cornwallis to retreat to South Carolina for the winter. It was a deciding factor in the Southern Campaign. January 17, 1781 was another significant, pivotal battle for the Continental Army. The Battle of Cowpen, under Brigadier General Daniel Morgan, a great tactician assigned by General Greene. It would be a turning point for regaining South Carolina from the hands of the British. 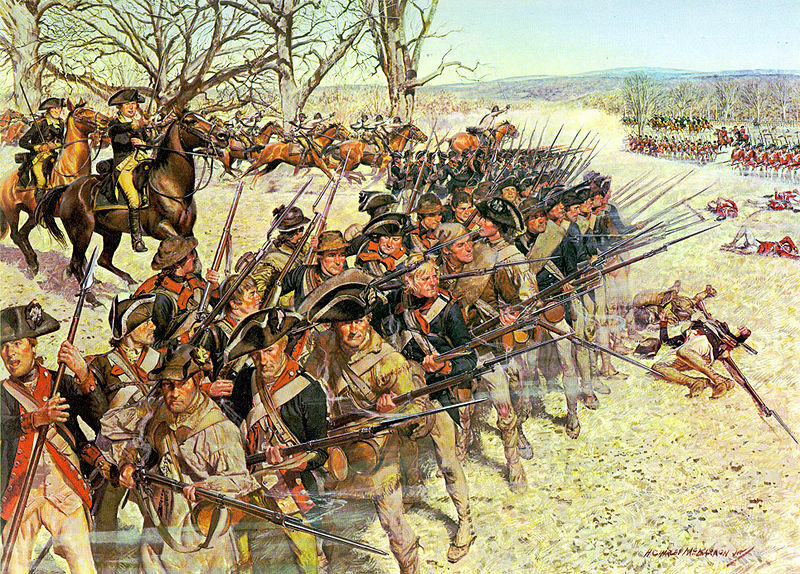 Morgan's forces were veteran's and many had fought at the Battle of Kings Mountain. His brilliant tactics resulted in exhausting the British lines, more than half fell to the ground, not only from exhaustion but also hunger and what was termed as "combat shock." The Battle at Cowpens lasted one hour. It has been considered one of the 'most complete victories of the war.' After the disaster of the Battle of Camden, Cowpens lifted the spirits of the colonists of the South. The Battle of Cowpens, painted by William Ranney in 1845. 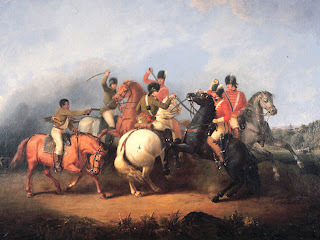 The scene depicts an unnamed black soldier (left) firing his pistol and saving the life of Colonel William Washington (on white horse in center). Cornwallis left his plans in South Carolina and went after General Greene's forces in North Carolina. Conflicts occurred at Catawba River, February 2, 1781, but Cornwallis finally met up with Greene at Guildford Court House, March 15, 1781, Greensboro, North Carolina. This battle is commemorated at the Guilford Courthouse National Military Park. Greene was defeated, however, he moved into South Carolina breaking up British control of the South. Cornwallis had moved into Virginia and tried merging with British Major General Phillips and American traitor Benedict Arnold. 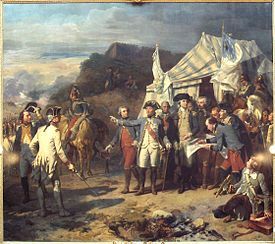 That decision would lead Cornwallis to Yorktown and his surrender to Major General George Washington and Lieutenant General Comte de Rochambeau. Source: downloaded from Prints and Posters: Soldiers of the American Revolution, Center of Military History. Access date: June 1 2006. NOTE: According to the Department of the Army, Lineage and Honors, 116th Infantry (Reproduced in Sawicki 1981, pp. 227-229), 175th Infantry (Reproduced in Sawicki 1982, pp. 343-345) and 198th Signal Battalion, - "Three current Army National Guard units (116th IN, 175th IN and 198th SIG) are derived from American Units that participated in the Battle of Guilford Courthouse. There are only thirty Army National Guard and active Regular Army units with lineages that go back to the colonial era." Every year around March 15, the Revolutionary War fighting techniques are demonstrated in period costume. Also, the movie THE PATRIOT, had it's final battle scene inspired by the battles of Cowpens and Guilford Courthouse. When Cornwallis moved into Virginia, General Henry Clinton was assigned making a deep-water port at Yorktown, Virginia.The Continental Army, led by the Marquis de Lafayette, followed Cornwallis. The French and American armies, known as the Franco-American Alliance, led the British to believe they were planning to attack New York. French warships sailed from the West Indies and arrived at Chesapeake Bay the end of August, 1781. In September, the French naval force defeated a British fleet sent to relieve Cornwallis at the Battle of the Chesapeake. This cornered Cornwallis from escape by sea. Washington and Rochambeau began marching with 3,000 American and 4,000 French soldiers, from Newport Rhode Island to Yorktown, Virginia on August 19, 1781. It would be known as the 'celebrated march.' When General Washington arrived with the Comte de Rochambeau in late September, 1781, they surrounded Yorktown, Virginia. The French flanked the left side, American's the right. Cornwallis was surrounded by army and naval forces. Cornwallis asked for capitulation terms on October 17, 1781. Siège de Yorktown by Auguste Couder, c.1836. Rochambeau and Washington giving their last orders before the battle. October 19, 1781, the official surrender of Cornwallis occurs with the surrender cemermony after two days of negotiations. Lord Cornwallis does not appear at the ceremony, claiming he is ill. Congress was notified of the surrender, celebrating for several day.s Washington's army relocated to New Windsor, New York, remaining until the official end of the war on September 3, 1781 when the Treaty of Paris was signed. 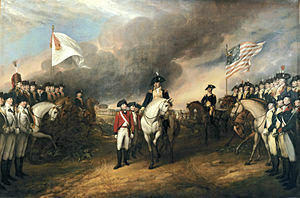 Surrender of Lord Cornwallis, by John Trumbull, depicting the British surrendering to French (left) and American (right) troops. Oil on canvas, 1820. Recently I was contacted by someone who had an issue with the genealogy software, BIRTHWRITE, which I had written about in my post dated October 9, 2008. He is having an issue which I invited him to explain in his own words, hoping that perhaps someone out there has some information to help him in his quest to find an answer. I am posting this on his behalf and so I can provide any updated information regarding this genealogy software I have listed. Component " COM DLG32.ocx or one of its dependencies not correctly registered; a file is missing or invalid'. I tried to locate the developer to no avail and was told I would need a copy of the Program to reload onto my computer in order to open my file. I was hoping there might be someone who can help me. I originally installed the program on my old XP which I believe was 32 bit and have since replaced that computer, I believe with a 64 bit. I did have them use the old XP operating system however. Since I am away from that computer for another month until March 20th I am not able to check to see if I am correct in my description. I was hoping someone out there may be able to provide me with a copy of the Program and I would be happy to remimburse for all shipping and costs. If anyone would like to contact Jack, please feel free to contact me and I will forward the message to him! Also, if you happen to know what happened with this software, I would love to hear from you in the form of contacting me or commenting! - The Northern Theater which was part of the American Revolutionary War --From 1778 to 1782, there were a number of battles that occurred between the American revolutionists and the British. The areas of battle were New York City, Upstate New York, Pennsylvania, New Jersey and New England. The British held quarters of operation in New York City and therefore there were skirmishes that occurred in that area. The other location of battles was seen on the frontier of Upstate New York and the northern end of rural Pennsylvania. The second area being fought by militia of each state involved and Indian allies against the Loyalist troops, Indians, British Indian Agents and British troops. In New England the French allied with American's against the British, trying to force them out of Newport, Rhode Island. After the Saratoga Campaign, the frontier war began. Recognizing the United States, France entered as an alliance. The French sent a fleet and an army to America, as well as the Caribbean and East Indies, and tried to encourage Spain to join also. This meant that the British had to split forces from North America to their hold in the West Indies, as well as other land holdings that were being threatened with invasion. They also had to be concerned about French invading Great Britain. So they left Philadelphia in 1778, making New York City their main location of operation for the Northern Theater of the war. But, they also had a plan to take over colonies in North and South Carolinas, Virginia and Georgia. It became the main focus for the remainder of the war, but there were still battles happening in Nova Scotia, Quebec, Rhode Island and New York. The British were using American Loyalists and Native Indian allies, and these were the troops that were sent out on raiding expeditions. These raids were against colonial settlements on the northern and western frontier lands, as well as using British naval maneuvers raiding the New England coastline. So while British were leaving Philadelphia by 1778, French fleets were arriving by July helping to increase the colonists actions against the British. While the continental army was engaged in these larger battles, the state militia and settlers of the north and west frontier lands in both Pennsylvania and New York were dealing with the raids that the British were strategically planning from their Quebec headquarters. The settlers themselves had to organize their own militia, supported by few Continental Army Regiments at first. These Regiments were from Cherry Valley (a village in Otsego County, NY), Fort Schuyler ( which was originally Fort Stanwix, in present-day Rome, NY) and Wyoming Valley (which was originally considered part of Connecticut, but is now Luzerne County, PA.). Although the colonists were alerted by the friendly Oneida Indians to oncoming raids, the attacks were devastating. Mohawk Leader Joseph Brant and his tribe, attacked Cobleskill, NY while the colonists were being massacred in Wyoming Valley. Of the Six Indian Nations, only the Oneida and the Tuscarora were Patriot Allies. 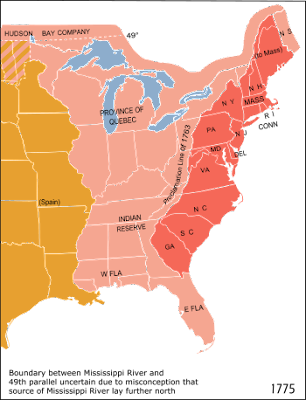 The frontier wars, namely in the Mohawk, Susquehanna, Delaware and upper Hudson River Valleys, and at times into what is now Vermont (at the time, part of New York), became so brutual, that the Continental Congress called the army to action. As a result of the call by the Continental Congress and in retaliation of the Wyoming Massacre, the Sullivan expedition of 1779, was ordered by George Washington, sending General John Sullivan to subdue Indian Attacks. He and his forces destroyed 40 Iroquois villages, as well as a huge amount of stored food supplies in upstate New York. They drove the Iroquois northern into Quebec by attacking their villages, and defeated Mohawk leader Joseph Brant and John Butler's troops at the Battle of Newtown. Brant had attacked other American allied tribal villages such as the Oneida, so that between Sullivan's raids and Brant's forces, much of the Iroquois territory was reduced to sporadic refugees. Despite the ravaging destruction, Sullivan's expedition did not stop the Indians from continuing the raids. However, the Iroquois never recovered from Sullivan's destruction to their food supplies and villages. Many died of starvation that winter. 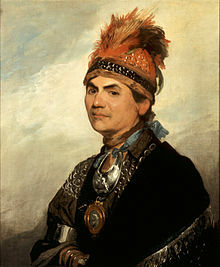 Although peace was initially agreed to in 1782, Mohawk leader Joseph Brant still tried to continue fighting. When the British no longer supplied him, his efforts ended. 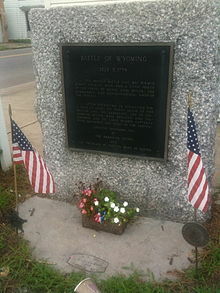 The Battle of Wyoming, also known as the Wyoming Massacre, is memorialized by the Wyoming Monument and the anniversary of the occurrence on July 3, 1778. It is observed annually by the 24th Connecticut Militia Revolutionary War re-enactors who volley tribute.The Wyoming Commemorative Association represents some of the leading families of the greater Wilkes-Barre area as well as descendents of those who fought in the battle. The battle was fought in what is present day Exeter, Pennsylvania. The original fort was located at Forty Fort, Pa. Note to my readers: I will be placing ads on my blog that I feel will help beginning researchers in their quest. For example, cameras are a very important piece of equipment for anyone researching their family tree. Therefore, I will place ads that I feel are appropriate to the content of my site and offers possible venues to aid you in your research. - Western Theater which was part of the American Revolutionary War -- occurred west of the Appalachian Mountains, 1775 to 1783. This area of the war was mainly fought by the British Allies in Detroit and the American Indians against the settlers south and east of the Ohio River. The British Crown Proclamation of 1763 forbid British Colonists from settling west of the Appalachians. It was meant to keep conflicts from occurring with the Indians and colonists. However, two treaties, The Treaty of Fort Stanwix and the Treaty of Hard Labour, were negotiated by British officials and the American Indians in 1768. This meant that land could be settled on south of the Ohio River. But, there were tribes that were not part of the consultation and these tribes were not happy with the Iroquois for selling lands without permission. The Shawnees tried to organize the Wyandots, Delawares and Mingos against the treaties. From 1775 to 1776, settlers and hunters in Kentucky were attacked by these disgruntled tribes, forcing them to head back East. In 1777, The British used this tension and began recruiting and arming Indian war parties to raid American settlements, launching the plan from Canada, via Detroit. Settlers in Pennsylvania, West Virginia and Kentucky were killed, the amounts of loss never accounted. In 1778- 1778, American Militiamen knew they had to initiate offensive tactics to secure the western border as the Indians forces were too strong along the Ohio River. 1780 to 1781 The British and Indian continued raiding settlements, killing hundreds in Kentucky alone. Thomas Jefferson, then governor of Virgina, planned for George Rogers Clark to head 2,000 men to capture Detroit. Clark was a Virginia soldier who was the highest ranking military officer on the northwestern frontier during the Revolutionary War. However, he never was able to amass the number of men he needed and left Fort Pitt August 1781 with only 400 men. But one hundred of his men were attacked by Indians as they closed in on the Ohio River. The plan was defeated. March of 1782 began the 'Year of Blood.' Pennsylvania militiamen were led by Lieutenant Colonel David Williamson into the Ohio Country. Their intent was to find the Indians who were attacking Pennsylvania settlers. They killed 100 Christian Indians, most of whom were women and children, after Indians had murdered a white woman and her baby. Then Colonel William Crawford led Pennsylvania militiamen into American Indian territory.They were forced to retreat back to Pennsylvania. However, during the retreat, Colonel Crawford and some of his men were captured and executed in retaliation for the earlier murder of the 100 Christian Indian women and children. More raids would occur, but neither side could maintain the territory it raided. The Shawnees lost their main hunting ground as the settlements grew in Kentucky. The Indians would continue without the British in the Northwest Indian War, despite the final treaty when Great Britain signed over the Ohio Country to the United States. However, due to continual threats of Indian Raids, Americans did not settle north of the Ohio River. In the end, the Indians were not consulted in the treaty, nor were they mentioned. - THE PHILADELPHIA CAMPAIGN was also a part of the American Revolutionary War --The British started the campaign in the Spring of 1777, after pulling out of northern New Jersey, in order to gain control over America's Capital City --- Philadelphia--- seat of the Second Continental Congress. 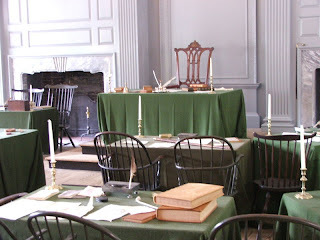 The Assembly Room in Philadelphia's Independence Hall where the Second Continental Congress adopted the Declaration of Independence in 1776. 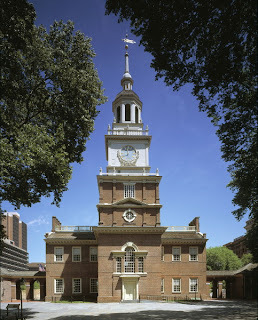 At the time, it was called the Pennsylvania State House. Carrying 15, 000 troops, British General William Howe transported his fleet via the Atlantic, entering Chesapeake Bay, landing at the head of Elk River August 25, 1777. Thereafter, he moved toward Philadephia where he was met by Washington's forces at the Battle of Brandywine Creek, September 11, 1777. Washington's troops were forced to retreat, suffering over 1,000 casualties. You can watch a reenactment from 2010 of the Battle of Brandywine Creek at this link on utube. The 16th of September, 1777, Washington was ready to hold against the British who were behind him. However, this battle is called the Battle of the Clouds because of a rainstorm that halted the armies and Washington had to retreat to Reading, PA. On the 19th of September, 1777, Continental Congress ran from Philadelphia to Lancaster, PA , but moved again at the end of the month to York, PA. September 21, 1777, without warning, the British attacked and defeated General Anthony Wayne's troops and September 26, 1777, British General Howe captured Philadelphia. With the unsuccessful battle of Germantown, October 4, 1777, where British General Howe had stationed, and the loss of Fort Mercer and Fort Mifflin, October to November, 1777, Washington was not able to prevent the British from taking over Philadelphia. 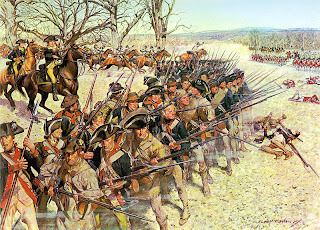 However, he was able to lead his troops into quarters for the winter at Valley Forge, PA by the middle of December. British General Howe resigned during his occupation of Philadelphia. Note to my readers; I will be placing ads on my blog that I feel will help beginning researchers in their quest. For example, cameras are a very important piece of equipment for anyone researching their family tree. Therefore, I will place ads that I feel are appropriate to the content of my site and offers possible venues to aid you in your research. - SARATOGA CAMPAIGN OCCURRING IN 1777 WAS PART OF THE AMERICAN REVOLUTIONARY WAR. Initiated by the British Command, namely General John Burgoyne, in North America in order to gain military control of the Hudson River Valley. The plan involved moving 8,000 troops in June of 1777 from Quebec via Lake Champlain to central New York and then by land through the Hudson Valley to Saratoga. Battle ensued with American Troops and culminated in the Battles of Saratoga which was a month-long series of strategic maneuvers beginning in September of 1777. However, the official dates of the Saratoga Campaign are noted as beginning June 14, 1777 and ending October 17, 1777. British forces surrendered to American General Horatio Gates. This victory resulted in France's decision to support the United States by sending soldiers, money and naval services. A great majority of the historic sites where the Saratoga Campaign played out are now preserved as state or national parks. Your will find monuments listed under National Historic Landmarks or on the National Register of Historic Places. Battles are regularly reenacted.